Red Bull Music presents the Red Bull Free Gaff this Easter Bank Holiday Weekend. Last year's Red Bull Free Gaff was the place to be, and this year looks no different. Taking place over three nights, will host three parties from late Friday, 19th April night through til the early hours of Monday, 22nd. There will be three floors of parties, playing three different genres of music for what's set to be one massive house party. Or you can join the party in the kitchen, or the dancing in the basement - whatever floats your boat. 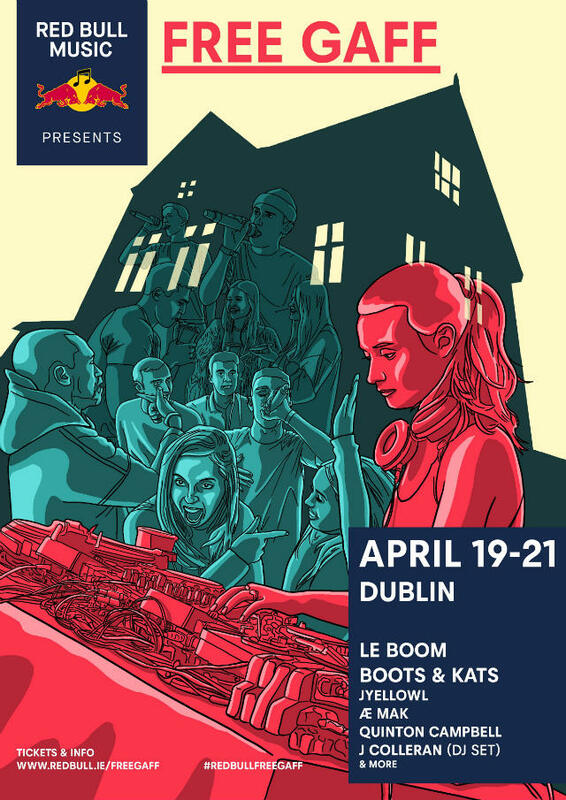 The Free Gaff will play host to Ireland’s best producers, hip hop and electronic artists - such as Le Boom, Boots & Kats, Jyellowl, Ae May, Quinton Campbell, Shy Mascot, and many more. Tickets for the event will go on sale tomorrow morning, Friday 29th, 10am. Tickets can be purchased for €20 excluding booking fee from their website. The Red Bull Free Gaff promises a massive gaff, city centre location, BYOB, deadly DJs, awesome live acts, serious tunes, pizza, immersive art installations, a big garden, and mates (optional).